Neighbours has brought back Callum Rebecchi for a brief cameo appearance. Morgan Baker reprised his role as the teen character in today's Australian episode as he caught up with his family in an online video call. With Toadie still recovering following his freak bouncy castle accident, there was no better time for Callum to find out how his loved ones on Ramsay Street are holding up. 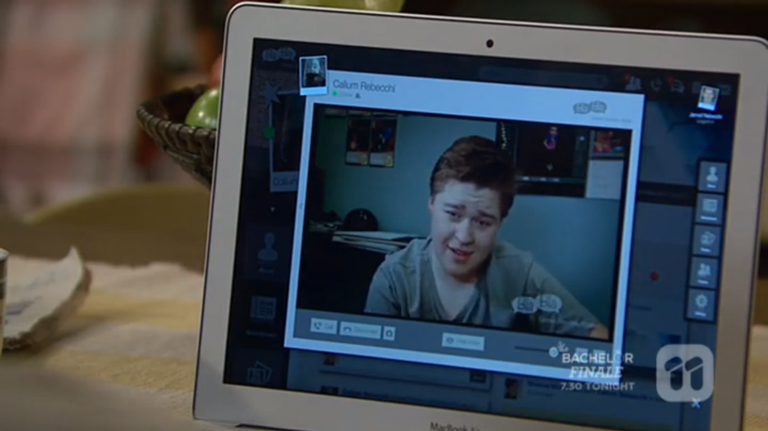 The scene showed Callum interacting with Toadie, Sonya and Karl Kennedy from the comfort of his bedroom in the US. Callum has been off screen since June 2014, as Baker decided to leave Neighbours last year to concentrate on his education. Explaining his exit at the time, a Neighbours spokesperson commented: "Morgan has made the very mature decision to focus on his final years at high school and while we will all miss him enormously, we also commend him for making this move. He has established himself as an incredibly talented young actor. Neighbours fans in the UK will see Callum's brief return on Thursday, October 1 at 1.45pm and 5.30pm on Channel 5. I liked Callum and it will be nice to see him back - even if it is just a brief cameo. I like how they're getting members of Toadie's family to pop in. 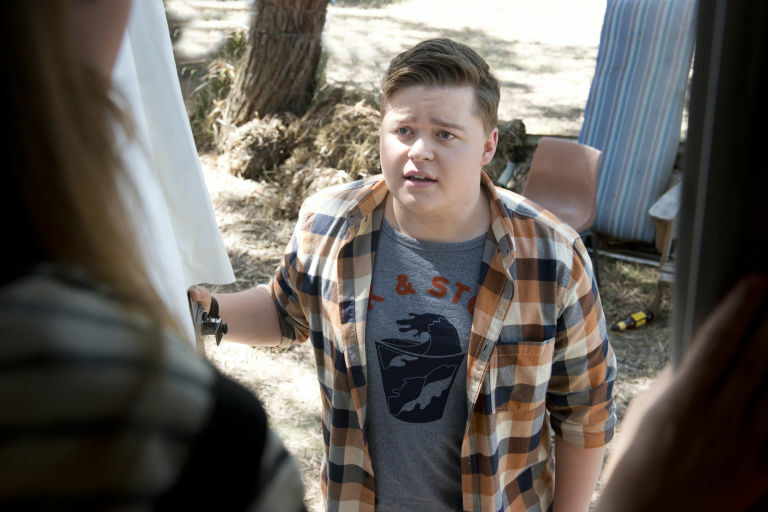 It's been over a year since Callum Rebecchi was last on our screens very briefly as part of the Neighbours gang, but it seems he'll be returning to the show soon. Ryan Maloney, who plays Callum's adoptive dad Toadie Rebecchi, revealed that his on-screen son will be coming back to Ramsay Street as part of the ongoing Dee Bliss return from the dead storyline. "It'd be great if he does come back," Ryan said. "He's not coming back in this storyline... Well, I might give you a little exclusive: he will be coming back." Don't be expecting Callum on screen in the too-near future though, as Ryan added that it'll be "more for the aftermath" that will get Callum back in Australia - and we've still got to figure out just what exactly Dee (or the Dee-imposter, if you believe some theories) is up to first. Of course, Ryan didn't let on more than that so it's not clear just yet whether Morgan Baker will be returning to the street as a regular, or just making a guest appearance. He left Neighbours in 2014, with a spokesman telling Digital Spy: "Morgan has made the very mature decision to focus on his final years at high school and while we will all miss him enormously, we also commend him for making this move. He has established himself as an incredibly talented young actor." Morgan has made a one-off appearance via video-call since his departure from the soap, phoning Sonya and Toadie after Toadie's bouncy castle accident from his bedroom in the US, where the character went to develop an app in Silicon Valley. At the time of his departure, Neighbours hinted that we could very well see Callum again. "Like many of our characters that leave, many return and we would love to see him back on Ramsay Street at some stage even for just a quick visit," the show said. 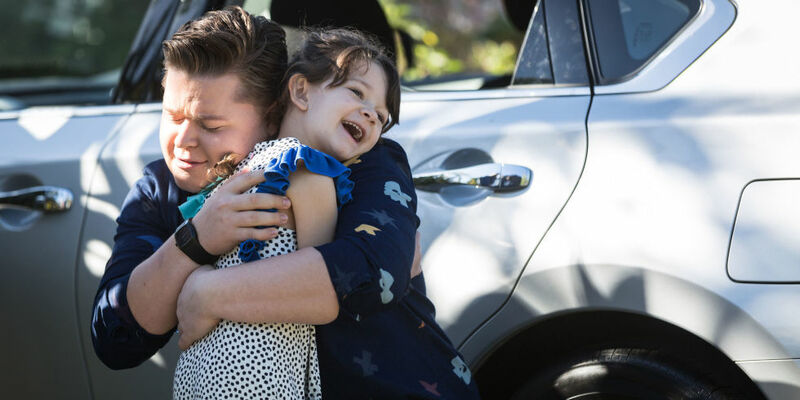 Neighbours welcomes back a familiar face next week as Callum Rebecchi makes his long-awaited return to Erinsborough. Neighbours legend Ryan Moloney announced that Callum (Morgan Baker) would be coming back to the show way back in January, leaving us to wonder when and why he'd be popping up again. Next week's episodes see Callum thrown into the ongoing drama surrounding his mum Sonya (Eve Morey) after she takes yet another turn for the worse. Although Sonya seemed to reach a positive turning point last week, her troubles still aren't over as she secretly pulls out of a planned stint in rehab. Toadie is alarmed when he discovers that Sonya hasn't checked in as promised, and his worries intensify when he learns that she's moved into a grotty caravan with a dodgy old friend. Sonya justifies her latest bad decision by insisting that she's too embarrassed to go back to rehab and she reckons her family would be better off without her. She even tells Toadie that she doesn't want him to represent her over the Backpackers crash anymore, believing that she deserves to be punished for the injuries she caused for Piper and David. Not seeing any other options, a desperate Toadie secretly makes contact with Callum and urges him to fly back to Australia to reason with Sonya. Agreeing to help, Callum visits Sonya at the caravan and begs her not to turn her back on Nell in the same way she did with him all those years ago. Will Callum's touching plea work? Or will Sonya simply lash out at Toadie for using their son as an emotional blackmail tool? 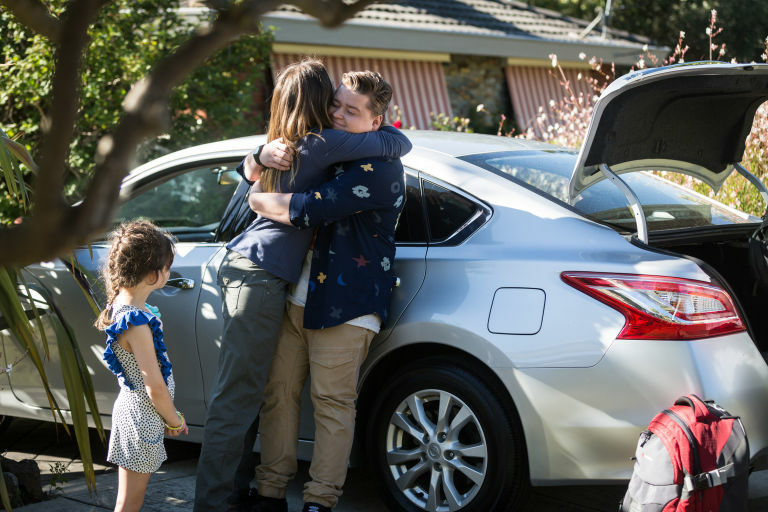 Neighbours teen Callum Rebecchi makes another emotional departure from Erinsborough in these brand new pictures. We've already revealed how Callum (Morgan Baker) is about to return to Ramsay Street in a desperate bid to help his troubled mum Sonya, but as these new shots show, he won't be staying around for too long. This week's episodes see Toadie (Ryan Moloney) make a desperate call to Callum as a last resort after Sonya's behaviour takes a worrying turn. When Sonya is found hiding away in a caravan with a dodgy old mate and stubbornly refuses to accept any further help with her upcoming court case, Toadie believes that Callum could be the only person to talk sense into her. As Callum confronts Sonya and begs her not to abandon her life with Nell just like she did with him all those years ago, it gives his mum food for thought and it could be exactly what she needs to hear right now. Neighbours' new pictures see Callum bowing out again after making some progress with Sonya – saying goodbye to her, Toadie and Nell as he prepares to return to the US. But just what is the situation that Callum is leaving behind? Is Sonya really off the booze for good? Is she prepared to fight for her future in court? And perhaps most important of all, will she reunite with Toadie? Neighbours airs these scenes on Monday, June 12 at 1.45pm and 5.30pm on Channel 5. Last edited by Perdita; 05-06-2017 at 04:26. Just barely, up till recently she never said a word! Callum is cool, wish he were back for more than a couple of episodes. Who tipped him off about his mum's illness? 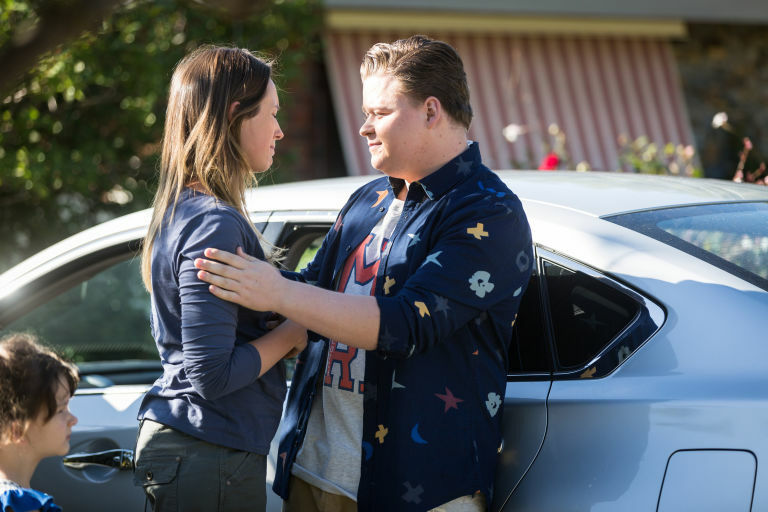 Neighbours has revealed a first look at Callum Rebecchi's return to Erinsborough in these new spoiler pictures. Morgan Baker has reprised his role as Callum for a guest stint, which ties in with Sonya's tragic cancer storyline. Callum returns home from LA on the day of a charity fundraiser that's been organised for the Rebecchis, leaving Sonya (Eve Morey) on the back foot as she hasn't told him about her illness. At first Callum tells his mum that he only found out about her news when he got off the plane, but he later slips up by admitting that he actually knew before he left. Sonya is livid that somebody went behind her back to tell Callum and initially suspects Toadie (Ryan Moloney), but Dipi steps in and confesses that it was actually her. In the heat of the ensuing confrontation, Sonya has some harsh words for Dipi but soon gets light-headed and Callum rushes to catch her. Wanting to ease the tension, Callum takes Sonya off for a picnic and gives her some home truths – insisting that she's the one in the wrong for keeping him in the dark in the first place. Sonya eventually comes to accept that Callum is right, realising that his love and support will be a huge help for her in the journey to come. Making amends, Sonya apologises to Dipi for losing her temper and looks forward to having Callum by her side in the coming weeks. Morgan played Callum as a show regular between 2008 and 2014, later returning for a handful of guest appearances. Neighbours airs these scenes on Wednesday, February 20 and Thursday, February 21 at 1.45pm and 5.30pm on Channel 5 (UK) and 6.30pm on 10 Peach (Australia).